As our understanding of injury pattern improves successful prevention stategies focused on gluteal and core strengthening have been developed and are shown to reduce injuries by approximately 50%. A simple gluteal stength test is to do a squat on 1 leg, if the leg veres towards the midline the gluteals are relatively weak. The most common mechanism is that the leg rolls in at the hip (termed internal rotation), if the foot is fixed (often to the ground) then the knee is subject to a significant internal torque which may exceed the restraining structures. Commonly this is the anterior cruciate ligament and the antero lateral ligament. In USA college studies of American Football, prophlactic bracing (Amour from DJO) has shown a similar reduction of 50% in injury rates. Graft Choice? Hamstrings or Bone Patella Bone? 2 decades ago Hamstrings (folded semitendinosus and gracilis) was popularised by several leading Australian surgeons. There was a swing away from bone patella bone (BPB) towards hamstrings. This was based on a number of factors including short term pain from BPB, difficulties on kneeling, loss of power on jumping, and concerns of a late back-of-kneecap arthritis rate upto 75% at 15 years. However Hamstrings have a geater tendency to stretch out in multiple studies, furthermore there is a loss of Hamstring power of approximately 10%. Additionally the medial Hamstrings act as a stabiliser to rotational knee giving way, ie they work with the ACL. When viewed from the side the medial hamstings are parallel to the ACL. Whether the Hamstring graft stretching out relates to the Hamstring tissue itself or the greater strain placed through a hamstring ACL graft due to loss of the hamstings is unkown. A show of hands a year ago at an ACL meeting in the UK showed a 99% hamstring choice by surgeons, however a year later there is a push back towards BPB. The history of our understanding of ACL injuries focuses on "anterolateral rotational instability" with early surgeries focused on creation of a soft tissue restraint on the antero lateral side of the knee. The focus then switched to the ACL itself, graft choices, fixation devices, tunnel positions, and one versus two bundle reconstructions. However re-rupture rates of 15% in 2 years are reported and furthermore the rotational stability test "the pivot shift" still reveal that the knee is rotational unstable following some ACL reconstructions. Following a scientific report Aug 1st 2013 on the Antero Lateral Ligament, there was a press release in the home country of Belgium published on 5th November 2013, from there it has been widely reported worldwide. The ALL goes a long along way to explain the rotational instability and perhaps how some patients manage very well without an ACL, and also why some patients are rotationally stable after an ACL reconstruction. The lever arm of the ALL to the axis of rotation is much more effective at prevention of rotational instability than the ACL. Several leading ACL UK surgeons have started reconstructing the ALL as part of a primary treatment with ACL reconstruction. 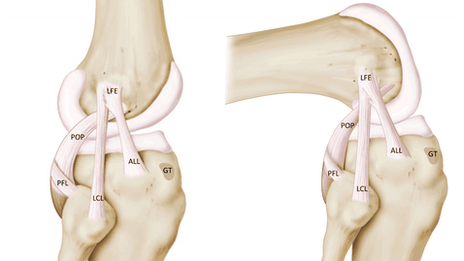 Others use ALL reconstruction in redo ACL to provide additional rotational restraint. The concept of ALL reconstruction or repair, perhaps even at the time of the initial injury opens up questions as who should have it, if any, at what time, and what technique. These are all unkown currently, it is possible that a primary repair of the ALL and the ACL will become the future treatment with or without augmentation. 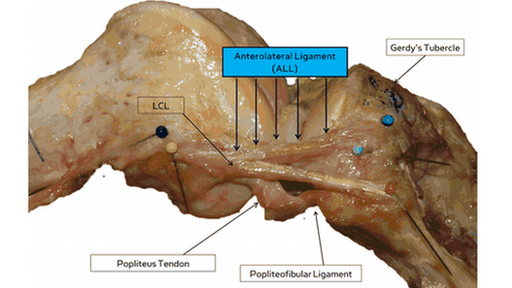 The ALL does represent a major advance in our understanding of the rotational instability following ACL rupture. In all but one of 41 cadaveric knees (97%), the ALL was found as a well-defined ligamentous structure, clearly distinguishable from the anterolateral joint capsule. The origin of the ALL was situated at the prominence of the lateral femoral epicondyle, slightly anterior to the origin of the lateral collateral ligament, ... The ALL showed an oblique course to the anterolateral aspect of the proximal tibia, ...its insertion on the anterolateral tibia was grossly located midway between Gerdy's tubercle and the tip of the fibular head, definitely separate from the iliotibial band (ITB).